Frontier Airlines launched its new routes at Mineta San Jose International Airport Friday with a daily nonstop route to Denver, with the first flight taking off for the Mile High City Thursday. San Jose Vice Mayor Magdalena Carrasco, SJC Director of Aviation John Aitken and Frontier Director of Stations Sean Morahan announced the start of the Denver-based carrier's service in the Silicon Valley at a news conference at the airport Thursday. 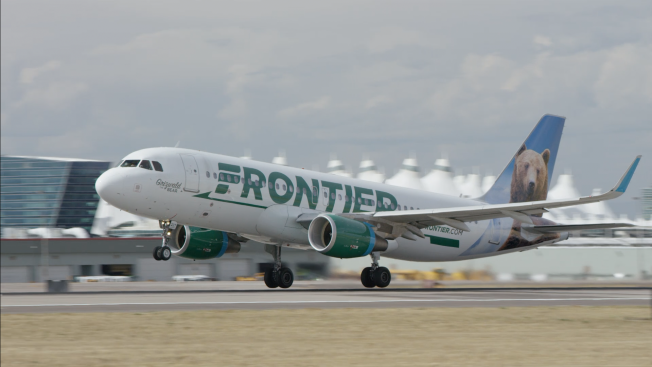 "We are soaring to new heights today with Frontier Airlines launching Denver as the first of seven cities offered nonstop from Silicon Valley," Mayor Sam Liccardo said in a statement. "I'd like to thank Frontier for its investment in San Jose and Silicon Valley, and for recognizing the growing importance and interest in our region among both business and leisure travelers." Additional nonstop service to Las Vegas will start Nov. 1. The airline will add nonstop flights to Atlanta, Austin, Colorado Springs, Cincinnati and San Antonio in April 2018. "We're pleased to welcome Frontier Airlines and their loyal customers to Silicon Valley's airport," said Aitken. "Frontier's ultra-low-cost fares and convenient travel times to seven U.S. cities where travelers want to go is a welcome addition to our community." 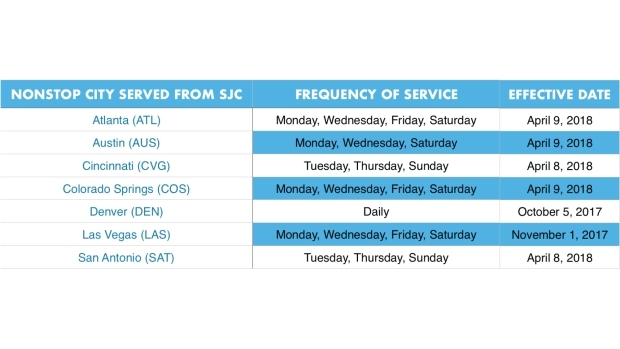 It is the first time San Antonio has been served directly from SJC, according to the airport. With the addition of these new nonstop flights marks 50 nonstop destinations served from San Jose International Airport.